Let's Eat, Let's Drink, Let's Brunch... Let's Dubai! WE LOVE DUBAI and it’s amazing bars, restaurants and brunches, the ever changing and growing market keeps us passionate about experiencing and sharing it all and in the process helping make it more accessible and affordable to all. Our new app update is our ultimate guide to Eating, Drinking & Brunching in Dubai and will remain free to download and free to use as we believe that’s how it should be. Tourists and Residents alike can make the most of Dubai, eat at the best restaurants, the best bars and the biggest brunches while saving money through Let's DXB! 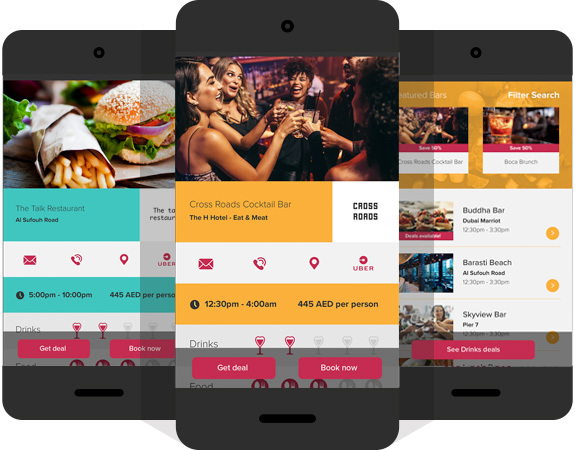 We’ve partnered with booking function app EAT to give instant booking capability at 100’s of Dubai’s best venues. Simply look for the ‘Book now’ Function. Save 100’s of AED per week with exclusive Discounts and Deals at Restaurants, Bars and Brunches across the city from 50% discounts to our infamous ‘have one on us’ FREE drink at the best bars in Dubai! No vouchers, No costs, No pre paying’s, just good old fashioned discounts at your fingertips simply for being a member. Use our mapping feature to see venues on the city map and choose restaurants, bars and brunches near you. Filter the happy hour function and check locations to plan your night out! Happy Hour near me? Easy! Mr & Mrs Brunch are ‘Food Influencers of the Year’ (BBC GoodFood Awards) and their tried, tested and honest reviews are infamous. In the app weve kept it simple with a 1-5 rating system on Food, Drink and Ambience. We’ve given our scored and soon, we’ll be asking you for yours! Our news feed function keeps you in the loop! The best events, ladies nights, gigs and quiz’s in Dubai all in one news feed. See whats on this week and even filter by day. Going out this Wednesday?…one click…look no further! Our one click happy hour function and one click ladies nights means you can see where is happy hour right now and where. Knowing where to go next has never been easier! Our app is designed with you in mind! We are Dubai residents and love the city, the app is designed to help get the best out of your time here! It is available on Iphone and Andriod and is 100% FREE so download Let's DXB and start living Dubai and saving today! Mr & Mrs Brunch, that’s us, are AJ & Lucy. We have been in Dubai almost a decade and WE LOVE DUBAI! We are so passionate about what this city has to offer, its bars, its restaurants and perhaps most importantly in Dubai, its brunches! After years of friends and family asking for our recommendations we decided to make a blog about our passion for eating and drinking in Dubai. As our blog grew, so to did our audience and our outlets with Instagram and Facebook thriving as more and more people took up our recommendations and read our tried tested and honest reviews. Supported by Zomato & Trip Advisor publications we quickly became part of the ‘foodie’ scene in Dubai and the UAE. Dubai’s F&B scene changes rapidly and as such we had to evolve just as fast to keep up. So in late 2016 we launched our debut app ‘Let's Brunch’. Let's Brunch brought together our reviews, provided detailed listings for all of Dubai’s brunches and what we worked hard on, it provided users discounts and deals at some of the best brunches in Dubai. Free to use, for all was our mission and Dubai residents and tourists alike can enjoy it all for FREE to this day. After a string of awards including ‘Food Influencer of the year’ from BBC Good Food, we decided to expand and Let's DXB was born. The ultimate guide to Dubai. Restaurant, Bar and Brunch listings and discounts and our favourite ‘Let's Explore’ which showcases the best events and nights out in Dubai this week!